When it comes to designing character sets from scratch, I am stuck so rely on these kinds of utilities to help me out. 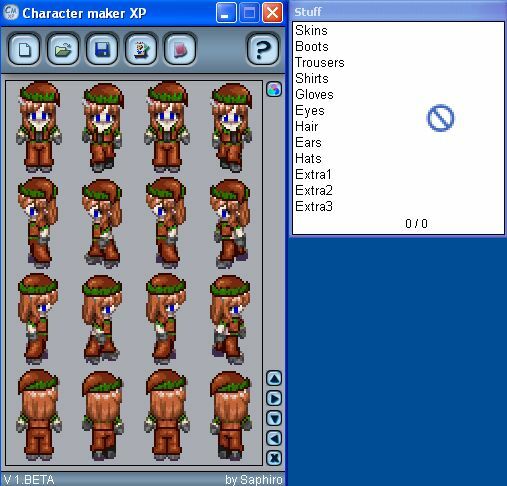 Character Maker XP makes life much easier, as it will create character sets and sprites for you. Although it is limited as far as the number of resources, you can still create some reasonably good custom character sets for RMXP, even with a small set of graphics available. As you can see from the snapshot above, characters are highly customizable, with a virtual mannequin to model the clothes and extras to work with. You can then export your finished product to RMXP character sets and then import them into your games. It also has a feature to edit the resources, but use with caution since it directly modifies the program’s default graphics, with no way to undo the changes, except to reinstall it. Its ease of use makes it a worthy addition to your games creation software, but the resources provided with this program are limited. There are slightly better ones out there, including online web editors, although this is perfect for quick character creation.